Then Why Is the English Monarch Portrayed as a Fatso Who Tossed Chicken Bones? Henry VIII is the most famous king in English history. Like all fame, Henry’s is a mix of fact and myth. He is most famous for having six wives, which he did. He is also famous for composing “Greensleeves,” which he did not. He is famous for breaking from Rome and becoming the head of the Church in England, which he was. He is thought by some to be famous for being a glutton, which he was not. How, then, did this high school jock of a prince become the “Humpty Dumpty of nightmare,” as he was once described. Even by modern standards, and certainly by those of the ordinary man or woman in 16th-century England, Henry ate a good deal. That was what his social group, the high nobility, did. When the noble entertained, food was often served in large quantities as part of the display of generosity or “magnificence” incumbent upon them, and as proof of their high social status. As king, Henry was the chief nobleman of the realm, so kept a large court and meal times were an important aspect of daily life there. The Eltham Ordinances for the royal household, published in 1526, indicate that the king usually had two main meals a day—what we would call lunch and dinner. He was fueled by red meat (venison, beef, and mutton) and poultry (chicken, partridge, and a wide range of other birds). Meat was often roasted and served with rich herb and butter sauces, but much was also consumed in the form of pies or pasties, together with bread. It was washed down with large quantities of beer, ale, and wine. Henry also ate a fair amount of fish (trout, carp, and many other kinds), usually on Fridays, in Lent, and at other times of the year in accordance with Catholic custom. Although the quantities specified for the king are large, much of this was for display; there is actually no evidence that Henry always ate all that was set before him. His diet was highly calorific, but until his late 30s, Henry’s relentlessly active lifestyle burned most of them off almost as fast he absorbed them. In his early 20s, the king had a 32-inch waist and 40-inch chest. His athletic build at 29 can be judged fairly accurately from a made-to-measure suit of armour he wore at the Field of the Cloth of Gold, the meeting held in June 1520 with his great rival Francis I of France. With the natural advantages of youth, Henry remained in reasonable shape with his weight proportionate to his height. (Mercifully for Henry, body mass index measurements and the like were the medical obsessions and tortures of a later age). Unfortunately, this same youthful athleticism in such dangerous sports as jousting and hunting led, almost inevitably, to injuries—not least to those legs of which the king was so inordinately proud. His first serious injury came in 1525. When he was hunting, Henry attempted to leap over a ditch using a stave. It broke, pitching him face down into the clay at the bottom of the ditch. Had a quick-thinking footman not lifted the king’s head, he would have drowned. By then Henry had developed ulcers on his legs, perhaps the result of incompletely healed (and unrecorded) injuries in jousting and/or hunting in previous years. He hurt his foot while playing tennis in 1527 and was forced to wear a black velvet slipper in consequence. The most serious recorded jousting injury came in 1536 when he lay unconscious for some two hours after he crashed to the ground and his horse ended up on top of his legs. By the following year there was evidence of ulcers in both the king’s legs, and Henry was clearly often disabled, unable to move without intense pain. Exercising in the way he had done as a young man proved impossible, although he continued to ride and to hunt for some years. His appetite was, nevertheless, undiminished. He quickly gained weight, which could then not be worked off. An unhealthy cycle was set in place. All of that would be enough to explain the king’s size as he entered the last decade of his life, but medical specialists have also suggested that his behaviors indicated symptoms of debilitating medical conditions. It is clear that despite his reputation for it, Henry did not suffer from syphilis. Tudor doctors treated the disease with mercury, but there are no purchases of mercury in the surviving royal doctors’ and apothecaries’ accounts. More recently and perhaps more plausibly, Cushing’s syndrome and McLeod’s syndrome have been advanced to account for Henry’s appearance and behavior. Their symptoms include obesity in the upper body, hypertension, irritability, and, in extreme cases, paranoia and psychosis. Type II diabetes, dementia, and deep vein thrombosis have also been offered for consideration. Such medical hypotheses may appeal, but none can be proven for lack of genetic evidence. Given the recent English predilection for digging up dead kings, however, such evidence may yet come to light—at least we know where this one is buried. 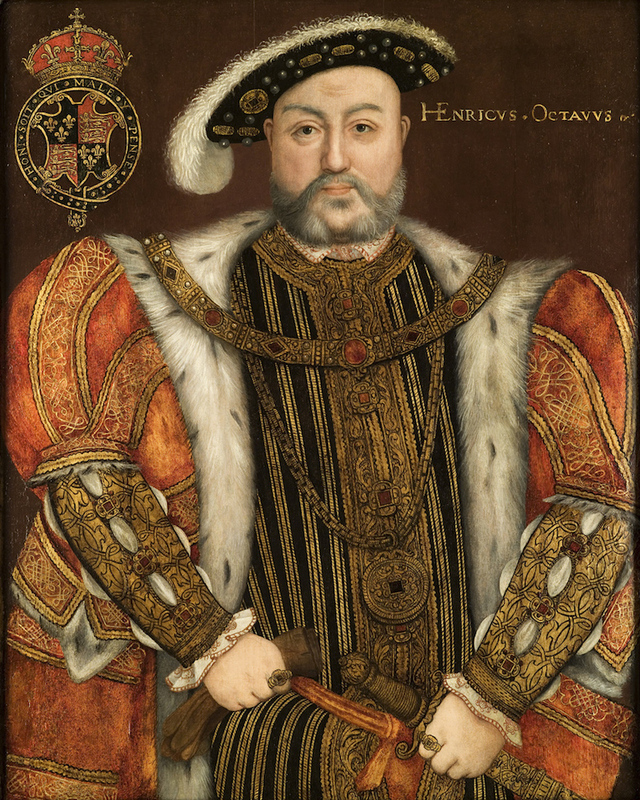 Henry is shown as big and robust in Holbein’s portraits of him in the 1530s, but as grossly overweight with a “moon face” (consistent with the syndromes named above) in an anonymous drawing of him towards the end of his life. 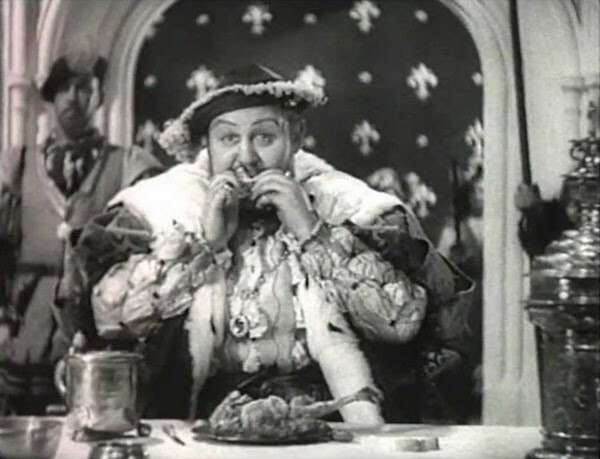 Yet, there is only one specific reference to Henry eating too much in all of the more than 20 volumes of the letters and papers of his reign. In 1541, the French ambassador, Charles de Marillac, who frequently made clear his distrust of the king in his correspondence home, reported that Henry was “very stout and marvellously excessive in eating and drinking so that people with credit say he is often of a different opinion in the morning than after dinner.” The popular image of Henry as a glutton seems to derive from the other elements of his historical reputation. Henry was a big man, a great bon viveur, a bully, and larger than life, so he must have been a glutton goes the reasoning. It is very largely the product of film and television portrayals. Charles Laughton hammed it up, throwing chicken bones about in the 1933 film, The Private Lives of Henry VIII. In a more serious vein, Keith Michell played the old and paranoid king in a “fat suit” costume in The Six Wives of Henry VIII on television and in a film version. Just about every other portrayal of the older Henry has also emphasised his girth in one way or another. By the end of his life, Henry certainly was morbidly obese. But the popular explanation, like so many aspects of his historical reputation, is based largely on misunderstanding and our wish to make him even larger in death than he was in life. On closer inspection, the evidence for Henry as one of history’s greatest gluttons is actually surprisingly slim! Glenn Richardson is associate professor of early-modern history at St. Mary’s University, London. He has published on many aspects of Renaissance kingship and the reigns of Henry VIII and Francis I of France in particular. This essay is part of Why We Feast, a project of Zócalo Public Square. Primary editor: Becca MacLaren. Secondary editor: Paul Bisceglio. *Lead photo courtesy of Lisby.